The focus for the current window display is the history of Photography which has been kindly sponsored by Celia Jones. We are indebted to the SW Photography School, Peter Bland, Chris Mansfield & Peter Best for the loan of some very interesting photographic items. 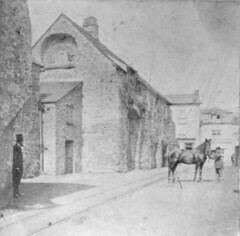 Lostwithiel Museum holds a unique collection of old photographs which record its fascinating evolution. Historic images help us to appreciate how the character of Lostwithiel has developed over the last 160 years or so. Lostwithiel was fortunate to benefit from the well-known Francis Frith & Co which produced picture postcards during the massive postcard boom of the Edwardian era. Issue 6 of our in-house magazine is in the process of being circulated to members of the Lostwithiel Museum Association. 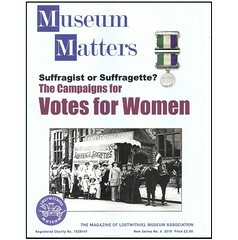 2019 Membership Application Form & Gift Aid Declaration Form which was also inserted in Issue 5 of Museum Matters. the 'casual' donations made by visitors to the museum. valuable sevice in promoting all that Lostwithiel has to offer & helping to boost the local economy. If you can spare just 2hrs a week during the season, please contact Maggie Lancaster on 01208 871456 who will be able to tell you more about the role of the Steward. There's lots of activity going on behind the scenes as we busily prepare for re-opening the museum for the new season on Monday 1st April. In order to open for at least 5 days a week from 10.30am to 4.30pm we need a minimum of 15 Stewards, each covering a 2hr slot. Without the invaluable role our Stewards play in running the museum we wouldn't be able to open to visitors. This season the role of co-ordinating the Stewards will be shared by Maggie Lancaster & Caroline Surgey. All volunteers are members of the Lostwithiel Museum Association, receive complimentary copies of the in-house Museum Matters magazine & are entitled to a free guided Town Heritage Walk. If you enjoy meeting people & are interested in helping them to get to know more about our fascinating town then we would like to hear from you. For more information please contact Maggie : 01208 873093. In addition to stewarding we have lots of other behind the scenes activities to offer you. The museum can cater for all your interests, whether you have a lot or only a little time to spare. We very much look forward to welcoming you as a member of our team. This season Mary Jones & her excellent team of Walks Guides have an extra treat to include in their itinerary, an opportunity to visit the Guildhall situated on the 1st floor above the museum. Owing to building repair works, access to this part of the building hasn't been possible for a number of years. The Heritage Walks Guides will start their regular weekly programme from outside the Community Centre at 11.00am on Monday 1st April. The cost remains the same as it has for the last few years, just £3.50 per adult & no charge for children. Please allow approx one & a half hours for a fascinating tour of historic Lostwithiel. If you are thinking about organising a walk for a group outside of our regular programme, then please contact Mary Jones : 01208 873504 to discuss your special requirements. 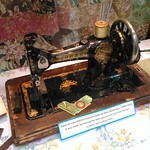 Deborah & Amanda's creation of 'A Stitch in Time' brings yet another thread of social history to life. Did you know that in 1830 there were as many as 8 dressmakers & drapers businesses in Lostwithiel but only 3 by 1902 ? The display features a piece of a patchwork coverlet made by local resident, Mary Parkin Beckerleg [nee Collier]. Sewing was associated with hard work, thriftiness, prudence & virtue. No home would have been without the familiar Singer Sewing Machine invented by Isaac Singer in 1851. The museum has received funding from FEAST and the Cornwall Museums Partnership to conduct a very interesting new project called 'Remembering People from the Past.' You can find out more about the Bright Sparks project via the above video, originally released in January 2018. Amanda Davidge our Curator will be working with museum volunteers to research people from Lostwithiel's history & create material that can be used to illustrate their lives. The workshops will then be offered to the public during the spring/summer. "Creating a Corporate Identity' in the Best Project on a Budget category. It was a tough competition last year but with more entries this year,the competition is likely to be that much harder. Having submitted the additional information required all we can do now is wait to hear the results at the Award ceremony on 21st March. Fingers crossed ! Improving the visual image of the museum has been a burning ambition for many years. Although we recognised that a visual makeover was well-overdue, the cost & logistics of transforming a small, cramped space in a listed building, had previously defeated us. Funding from our achievements in the 2018 Cornwall Heritage Awards is enabling this ambition to gradually become a reality. Stage 1 of the project focused on re-designing the obvious visual items: stationery,leaflets,posters & pamphlets whilst also improving the vital external signage.The re-designed fire engine logo & the distinctive royal blue colour are instantly recognisable as belonging to Lostwithiel Museum. Conscious of the need to enhance the visitor experience & create a more comfortable space for volunteers to spend time in. Stage 2 concentrated on transforming the Reception area.We commissioned Chris Mansfield,a local carpenter,to design & make a desk to include shelving for admin items & a lockable cupboard for volunteers to store their personal items whilst on duty. Witnessing the transformation & hearing the positive comments from visitors & volunteers confirmed our resolve to make this project a longer-term priority. The winter closure period is perfect timing to put the finishing touches to the Reception area & to start on Stage 3, the refurbishment of the Reference section. The installation of the bespoke shelving & cupboard with improved lighting,will help to make access to information an easier & more enjoyable experience. As the 'new look' develops we are encouraged to want to make further changes. Enhancing its appearance is helping to create a more desirable professional image & give the museum the identity it previously lacked.